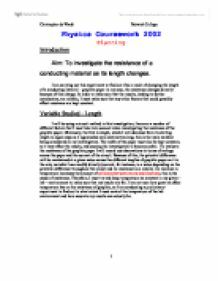 To investigate the resistance of a conducting material as its length changes. 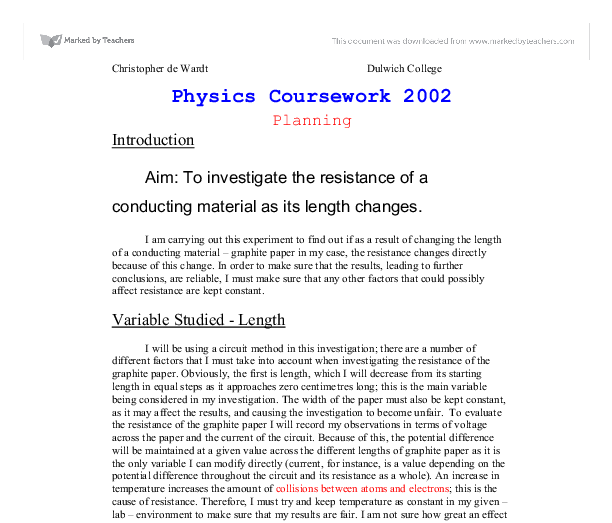 Aim: To investigate the resistance of a conducting material as its length changes. I am carrying out this experiment to find out if as a result of changing the length of a conducting material – graphite paper in my case, the resistance changes directly because of this change. In order to make sure that the results, leading to further conclusions, are reliable, I must make sure that any other factors that could possibly affect resistance are kept constant. As the maximum temperature change of the lab environment is only likely to be around a few degrees at the very most, my results suggest that the decrease of accuracy of my main experiment will be very small. For example, my graph shows that if there was a change of temperature from 20ºC to 22ºC in the lab, the accuracy of my results would 0.012kΩ too high, which would be a percentage error of around +0.36%. Therefore, in the context of this experiment, temperature will have almost no effect on the reliability of my results in the lab environment. The circuit should be assembled as shown above; the slide on the rheostat should always be adjusted so that the digital voltmeter reads 1 volt. As shown in the table, and as I wrote earlier, voltage must be kept constant to make this a fair experiment. 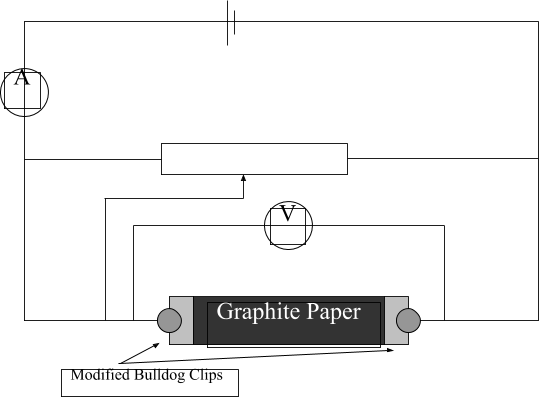 Also, the width of the graphite paper must be kept constant throughout the experiment – easily done by simply using the same piece of graphite paper cut to shorter and shorter lengths. -1 and as voltage was kept constant at 1 Volt in this experiment, effectively R=I-1. Because of this, and the line of best fit seems to suggest a ‘squared’ relationship, I believe a graph showing resistance against length would show a direct proportionality. 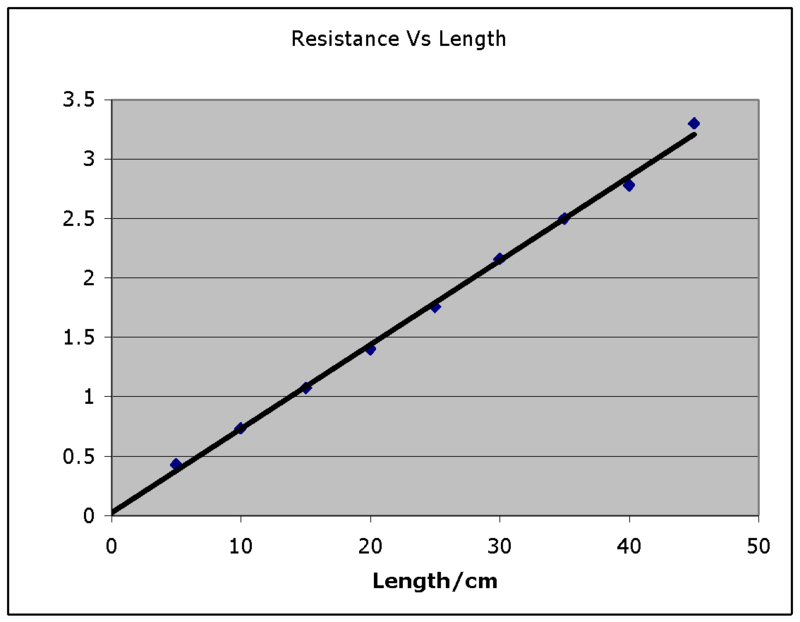 This graph shows that Resistance increases with length; it shows that resistance is directly proportional to length. Specifically for my width of graphite paper it shows that R= ~70*length. The fact that resistance has been shown to be directly proportional to length - in this case - fully supports my prediction. This allows me to conclude that the scientific basis for my prediction was sound, and that the number of collisions between electrons and atom sites determines the value of resistance in a conductor. As I found that my results fell in line with previous scientific knowledge, it suggests that my experiment was carried out accurately, and that the use of repeat readings is a good way of getting closer to the ‘ideal’ values which previous scientific study suggests I should be finding. The accuracy of my results also shows that my conclusions have a firm basis; by comparing my own personal results with others carrying out similar experiments, they seem to be similar enough to ensure that they are accurate. In order to make sure these results are reliable, even further amounts of readings could be taken using different sets of equipment to ensure that the experiment remains fair. Thus, the average charge is approximately 570 C �11.3%. Total charge = Sum of all 3 average charges Total charge = 540 C + 480 C + 570 C Total charge = 1590 C Absolute uncertainty of total charge = Absolute uncertainty of total charge = 192.51 The total charge is 1590 C �192.5 C.
I think that this could be the source of any anomalous results, such as the results for 10°C and 25°C. Another reason for there being anomalous results is that the sensor unit didn't have enough time to stabilise before I took my reading. This means that there are more collisions between them leading to an increase in the resistance. To achieve keeping the temperature of the pencil lead constant I will let the pencil lead cool for a couple of minutes after each reading as well as keeping windows closed to try and keep the room temperature constant. The temperature coefficient varies with different metals used in the experiment, and the resistance varies with which metal used and the apparatus and it's environment. 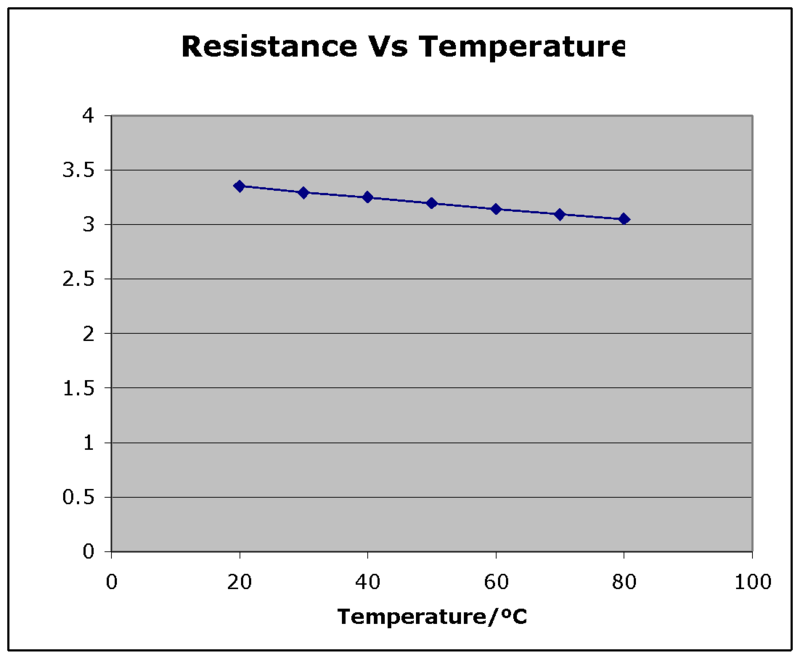 The strict definition of the temperature coefficient of resistance (a) is the change in resistance per ?C rise in temperature of a specimen of the material which has a resistance of 1 ohm at 0?C. I recorded these readings at four different load resistances. I repeated the experiment at each voltage setting three times. The voltage settings used were: 2V, 4V, 6V, 9V and 12V. For this experiment I used a long rheostat which I expected to give me smaller increases in current. I was expecting that the internal resistance of the power supply, i.e. Using this equation, we can make a graph of the distance against the light intensity. This graph shows us the relationship between the distance and light intensity. The area of a sphere can be worked out by using 4?r�. x 50040 V = 5.004 Total resistance calculated from meter readings, from Ohms law = = 50040? Because there are no parallel branches for the current to flow in this section of the circuit we are considering, the current will always be the same as you give the resistor to start with plus the 40?